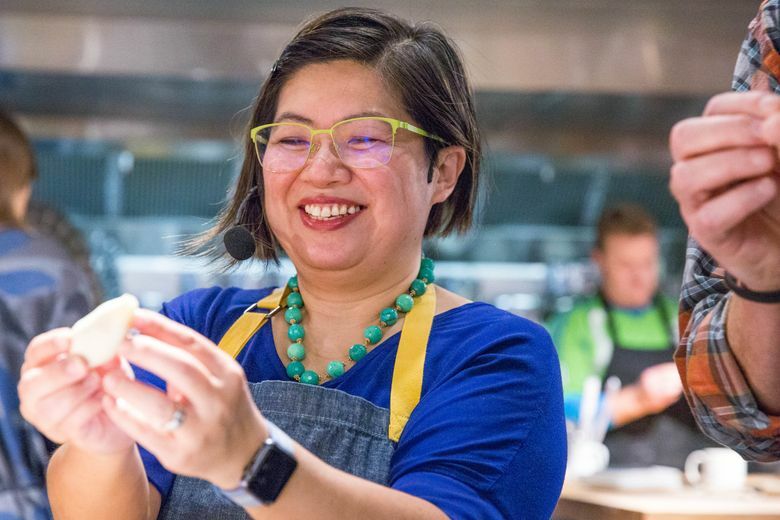 Hsiao-Ching Chou writes in her new book, ‘Chinese Soul Food,’ that the key is to focus more on the ingredients at hand than on recipes or menus. IT’S NATURAL THAT Hsiao-Ching Chou would be comfortable with Chinese cooking. 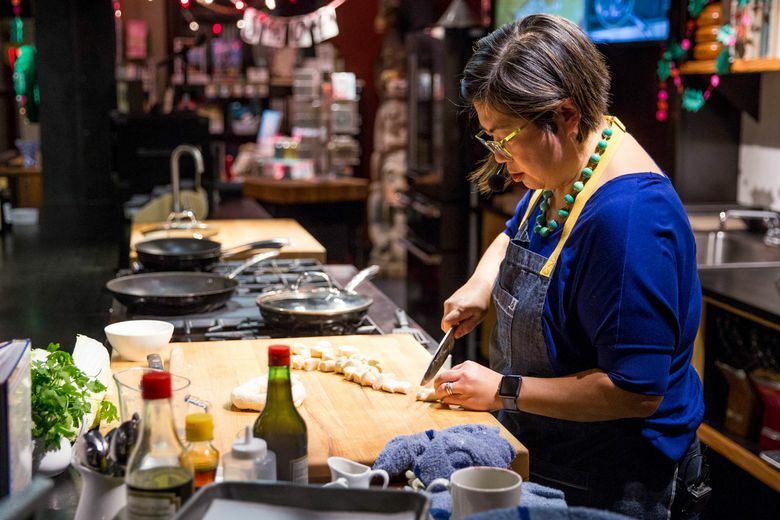 Chou, former food editor at The Seattle Post-Intelligencer, learned to make Chinese dumplings as a child at her mother’s side. Her parents ran a Chinese restaurant in Missouri after completing their education there. 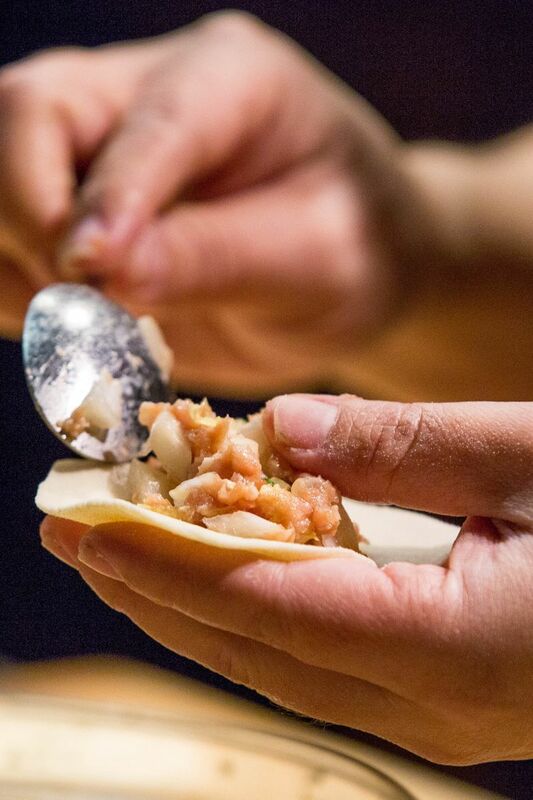 As an adult, Chou demonstrated pot stickers for Anthony Bourdain on his “No Reservations” TV show. 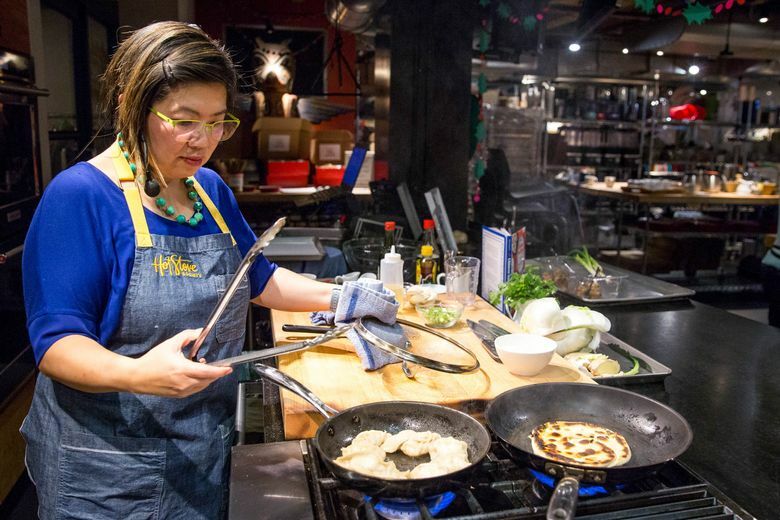 Chou’s goal, though, is to get people in the kitchen who are less comfortable making soup dumplings, red-braised pork belly and other dishes more often associated with restaurants. 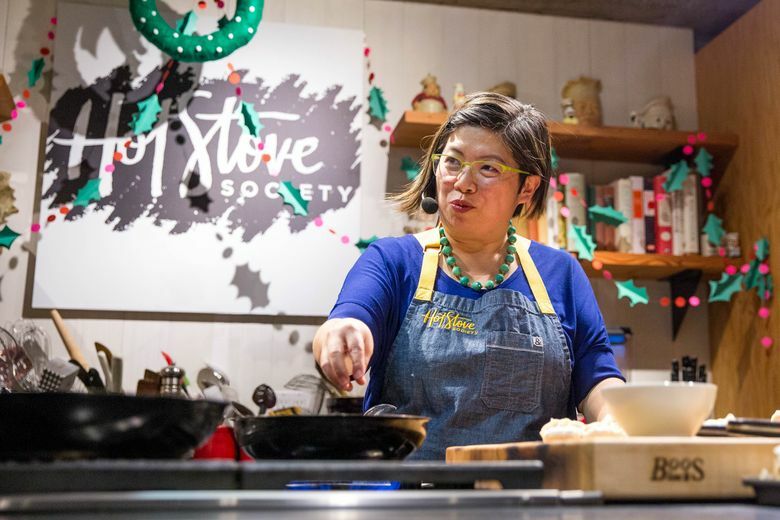 She teaches Chinese home cooking at Hot Stove Society, and provides recipes and advice in her new book, “Chinese Soul Food” (Sasquatch Books, $24.95), released in advance of the Chinese New Year, which is on Feb. 16. • Chou will speak about her new book, “Chinese Soul Food,” at 6:30 p.m. Feb. 12 at The Book Larder, 4252 Fremont Ave N., and at 7 p.m. Feb. 13 in the Microsoft Auditorium at Seattle Central Library, 1000 Fourth Ave.
• A demonstration of Chou making pot stickers is online at mychinesesoulfood.com/videos. Chou realizes some ingredients and flavors in Chinese cooking might be unfamiliar to home cooks, or that they might be intimidated by long lists of ingredients. And the most common “aha” moment she sees from students is that a given dish wasn’t as hard to cook as they had thought. 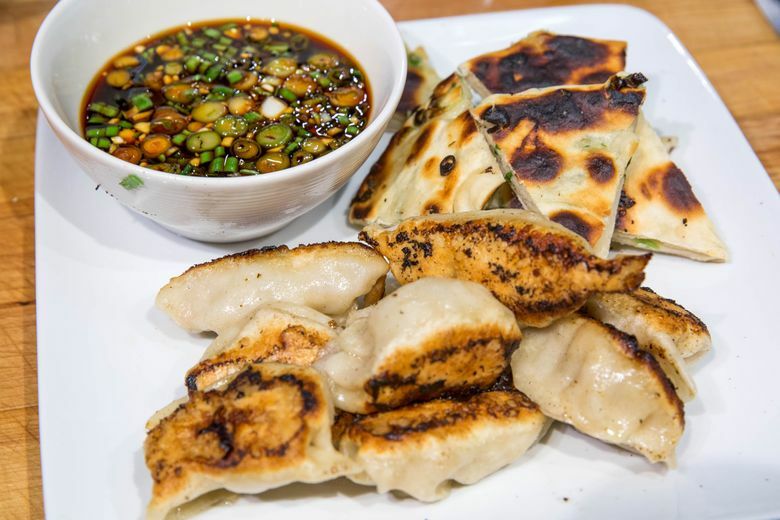 In a recent Hot Stove Society class, Chou mixed all-purpose flour with water to form a dough that could be used for pot stickers, scallion pancakes and noodles. She still makes dumplings of all sorts at home with her family — including her mother, husband and two children. 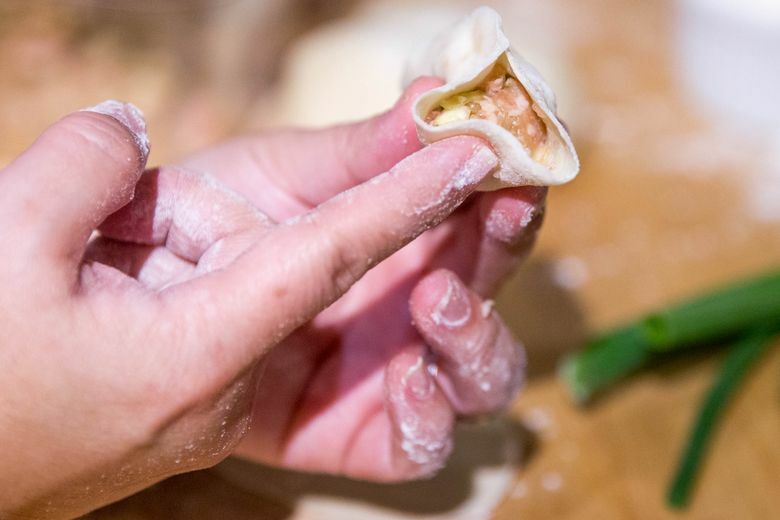 Around age 5, she recalls in the book, she saw dumpling-making as “an act of community” for the first time, when her late father was studying for his master’s degree. Her parents moved the dinner table to the middle of their student-housing living room. Friends gathered around to share the work, using a makeshift rolling pin sawed from a broom handle. At her class, when the fillings were laid out on the wrapper and it was time to seal them, she told the group that each person would naturally develop a signature fold. “It’s like your fingerprint,” she told them. At the family dumpling gatherings she hopes her students will hold, they’ll be able to tell who made which one. Place the flour in a mixing bowl. Add the water and, using a rubber spatula or wooden spoon, stir the water and flour together. Continue to stir gently until a ball of dough starts to form. Start kneading the dough to make a ball. The dough should feel slightly tacky but not damp. Cover the dough with a damp towel or plastic wrap, and let it rest for a minimum of 20 minutes. Combine all the filling ingredients in a bowl, and mix well. Divide the dough in half. Roll each half into a rope that’s about ¾-inch in diameter and about 18 inches or so in length. Cut each rope into pieces that are about ¾-inch thick (or about 9 or 10 grams). Roll each piece into a ball, then press it between your palms into a silver-dollar-size disk. With a Chinese rolling pin (available in Asian markets) or a ¾-inch wooden dowel from a hardware store, roll each disk into a flat circle about 3 inches in diameter. Don’t worry about making a perfect circle. Place a dollop of filling, about a teaspoon or so, into the center of a wrapper. Fold the round wrapper in half over the center into a half-moon shape, and pinch shut along the edges. The dough should be just sticky enough to seal without using water or egg. Repeat until you have used up all the dough, or you run out of filling. Heat an 8- to 10-inch nonstick skillet over medium-low to medium-high heat (you might have to adjust the heat according to your stove). Add about 3 tablespoons vegetable oil, and swirl it around to coat the bottom. Place as many dumplings in the skillet as will fit. Add ½ to ¾ cup water to the pan, depending on the size of the pan. Cover immediately with a lid, and do not remove it, or the steam will escape. Cook until bottoms are crisp and brown but not burned, about 7 to 9 minutes. The sizzling will subside as the water evaporates. Remove the pot stickers, and serve with Soy-Ginger Dipping Sauce. Mix all the ingredients in a small bowl. If you have time to let it sit for at least 30 minutes, the flavors will meld together. The longer the mixture rests, the more intense the flavor becomes. Once mixed, the sauce will keep in a sealed container in the refrigerator for up to a week. 1. Place the eggs in a large pot. Add water until the eggs are covered by about 1 inch. Bring to a boil over high heat. Reduce the heat to low, and let simmer for 8 minutes. 2. Remove the eggs, reserving the water. Run the eggs under cold water for 1 minute to make the shells easier to handle. Crack the shells all over, gently, with the back of a spoon, but don’t break off the shells. You want to create a marbling effect around the entire egg. 3. Add the soy sauce, star anise, cinnamon and peppercorns to the reserved cooking water. Add the cracked eggs back into the pot. Bring to a boil over high heat, then quickly reduce the heat to low, and let simmer for about 15 minutes. 4. Transfer the eggs and liquid to a large container with a lid, or use a large bowl and plastic wrap. Let the eggs steep in the refrigerator overnight, or up to two days (the longer they steep, the more pronounced the marbling). Peel the eggs to reveal the marbling, and serve. The eggs can be stored in the refrigerator for up to three days. Courtney Pedroza is a Seattle Times staff photographer.